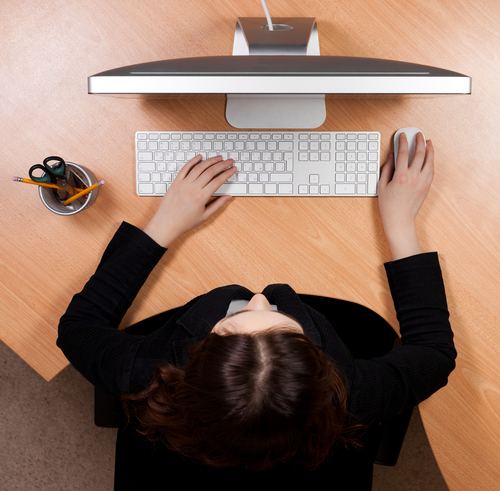 Ergonomics can help reduce the risk of eyestrain and ease many of its inconvenient and uncomfortable symptoms. Ergonomics is the study of people's efficiency in their working environment. The goal of ergonomics is to create workspaces that properly fit people to help optimize their performance and reduce their risk of injury. While eyestrain is temporary and generally not serious, this type of visual impairment can often impair workers' performance. Sit with your shoulders square to your screen so you're facing it directly without having to turn your head or twist your torso. Make sure your computer screen is approximately 18 to 30 inches away from your eyes. Your screen should be close enough that you can read text easily without leaning forward. Looking at a screen that is too far away can cause you to strain your eyes to see small text while a screen that's too close can make it difficult for your eyes to properly focus. Whenever you're using printed documents in conjunction with your computer screen, use a document holder to keep those printed sheets in place. Place the document holder at the same height and distance as your computer screen to make it easier for your eyes to move back and forth from screen to print document. Schedule a comprehensive eye exam with your eye doctor. Almost 71% of people who report symptoms of computer eyestrain wear eyeglasses or contacts so it's important to make sure that your prescription is correct and up to date. Tell your doctor about your workstation setup and the number of hours you spend each day on electronic devices and if you are experiencing symptoms of eyestrain so they can make the best treatment recommendations possible.